Recovery from exercise is integral to the physical training process. There is a perception among older athletes that aging negatively affects the recovery process. Plausible arguments for an impaired recovery with aging are a greater susceptibility of older muscle to exercise-induced skeletal-muscle damage and a slower repair and adaptation response. Differences in the physical activity level of the research participants are rarely considered, however. This makes it difficult to differentiate the respective roles of declining physical activity and aging on the recovery process. Furthermore, the type of exercise used to induce damage and monitor recovery is often not indicative of a normal training stimulus for athletes. 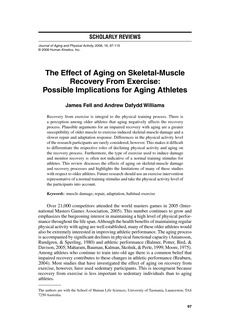 This review discusses the effects of aging on skeletal-muscle damage and recovery processes and highlights the limitations of many of these studies with respect to older athletes. Future research should use an exercise intervention representative of a normal training stimulus and take the physical activity level of the participants into account.